After the period of Brahmas 100 years become over, then Mahapralaya comes. After the Mahapralaya the Universe is in unmanifested state. There are no name and forms, even the space is not there, everything is enveloped by darkness alone. The state of Universe is like as described in Nãsadiya Sukta of RigVeda which I discuss here. After a long time a desire comes in the unmanifest to become many. So, he chooses to make his own form which is most auspicious, all knowing abd the best. 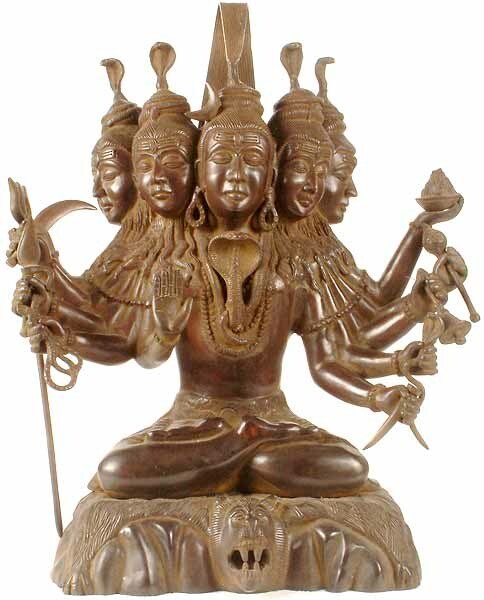 And that form is of five headed three eyed Lord which is named as SadaShiva (ever auspicious). Its names go on changing. After a long time a desire developed in him to get himself multiplied. Or in other words he thought that he was one and he should be multiplied into many form. The said being, having no form of his own, created an auspicious image, during the course of his own sport, possessing all the virtues and fortunes, besides the power, qualities and knowledge. A form which could move everywhere, displays all the forms, could visualise everything, should be all powerful and respectable by all, should be the ancient most and which could make all the people civilized. Then he created the auspicious image of Isvara, then the original being who was beyond comparison, eternal, beyond measure, form of consciousness, which illuminates everything, form of pure knowledge, all pervading, indestructible, and supreme Brahman, disappeared. The manifest form of formless being is Sadasiva who is presently called by the people of wisdom as Isvara. The lonely Isvara produced from his own body an everlasting Sakti. This Sakti did not effect his original body in any way. The said Sakti is variously known as Pradhan-Prakrti, Maya, Gunavati, Para. She happens to be the creator of the Buddhi-tattva (cosmic intelligence) and is unblemished. The same Sakti is also called Ambika, Prakrti, besides being the mistress of the three worlds. She is the mother of the three gods. She is everlasting and the main cause of the creation. Siva (SadaShiva) is five faced, a pleasant soul, holder of a trident, having complexion as white as the camphor, keeps on applying holy ashes over the body. Thus Lord SadaShiva is called five-faced because he choose that form when he first manifested from unmanifest. In this way he also got his name as PanchaMukham. As a sidenote each head of SadaShiva is of significant importance which I discuss in my answer here.. Also Sada Shiva carries various symbols in his hands which I discuss here. Not the answer you're looking for? Browse other questions tagged scripture shiva shiva-purana . How can Shiva puranam and Vishnu puranam be interpreted?